Railpictures.ca - Geoff Elliott Photo: CP 8136 leads KCS 4845, and Union Pacific SD40N #1950 on train 141 as it rolls through Haycroft, Ontario and the flatlands of Essex County on it’s journey to the U.S. | Railpictures.ca – Canadian Railway Photography – photographie ferroviaire Canadienne. Copyright Notice: This image ©Geoff Elliott all rights reserved. 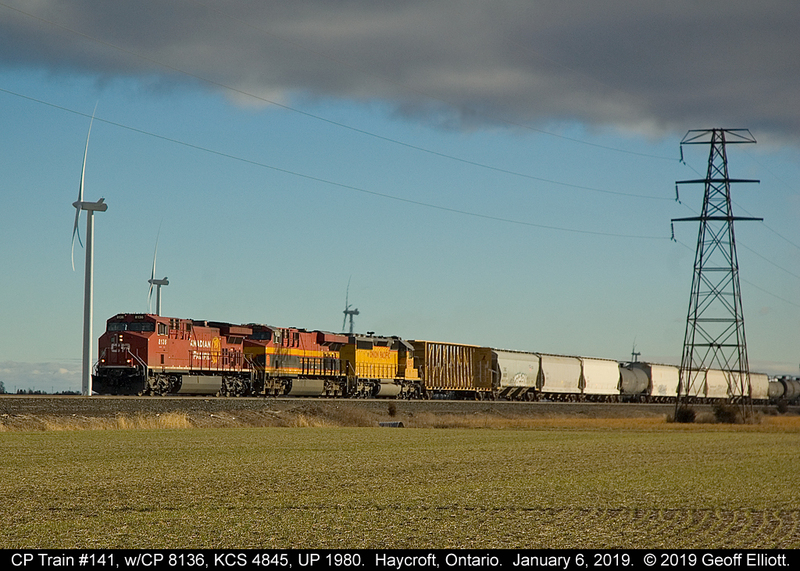 Caption: CP 8136 leads KCS 4845, and Union Pacific SD40N #1950 on train 141 as it rolls through Haycroft, Ontario and the flatlands of Essex County on it's journey to the U.S.